This 68" diameter unfinished French tablecloth panel can be finished either round or square. It is made from 100% shirt-weight cotton. 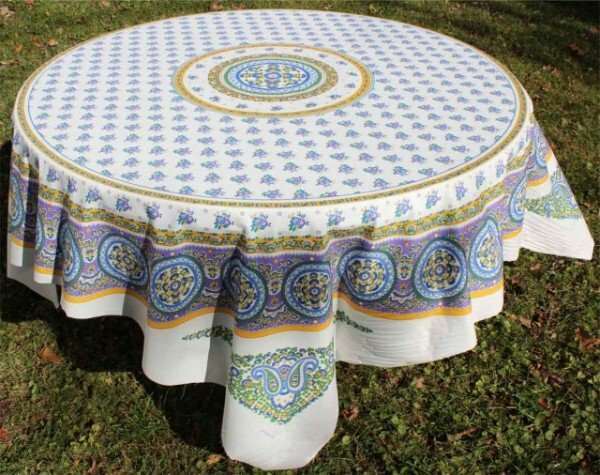 The tablecloth panel is printed with a circular pattern, featuring flower motifs printed in the corners. This design comes straight from Camargue, a French national park. In this park, horses still roam, and French cowboys maintain their traditions of herding the bulls! Feel the history of Arles and Nimes!